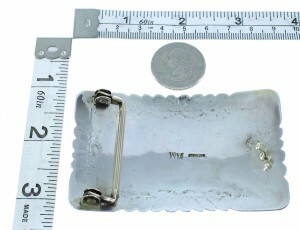 Belt buckle measures approximately 2" long, 3-1/4" at widest, and will fit a belt that is up to 1-1/2" wide. 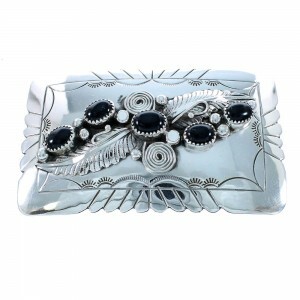 This is truly an outstanding belt buckle that will make a great impression! This piece of Native American jewelry is Navajo hand crafted by artist Wilbur Myers, out of genuine sterling silver and real Onyx stones. A total of FIVE stones are gently placed in hand cut bezel settings, while being accented by hand crafted scalloped leaf designs, mini silver beads, and hand cut silver work for a dazzling finish. The Belt Buckle is stamped sterling and hallmarked.